That should pull the certificate from the server and put it within his Trusted Root Certificates directory. Are you an existing syphonsoft customer or joining now? And know somebody who would also like hosting? Refer a friend and get 3 months of hosting absolutely FREE!! Refer as many friends as you like. The more that join the more free hosting that you receive. There is no limit to the amount of months free you can get off of your hosting account for completed hosting referrals. This is the ONLY fine print – Each referral must complete a 1 year hosting agreement before you receive 3 months free from your hosting account. Has some official looking security program taken over and hijacked your machine? Unable to get out to the internet? Running really slow? Scared that all is lost and you will have to start over? Or take your machine to some chain computer store to have teenage kids working on your machine, just to overcharge you? Well, then you need us, we can get your machine back on track in 1 business day or no charge. That’s right, we fix your machine or NO CHARGE to you. Have you tried everything, all of those internet hacks, spyware, malware, trojan horse virus removal software, but not working… Heck, you probably can’t even get on the internet to find out what is wrong or how to fix. Have a friend or a kid that usually does this for you, but too much for them? Not too much for me! $85 to take a computer that is overridden with debilitating viruses and remove and quarantine these pesky harmful damaging bugs from your computer. Don’t worry, we’ll get it off of your machine, so that you can get back to surfin’ the internet!! Your privacy and the privacy of your machine and data are our utmost importance. syphonsoft.com, I work out of the home. Drop off your computer to me and it will be returned in 24 hours, virus free. Great list of download software. 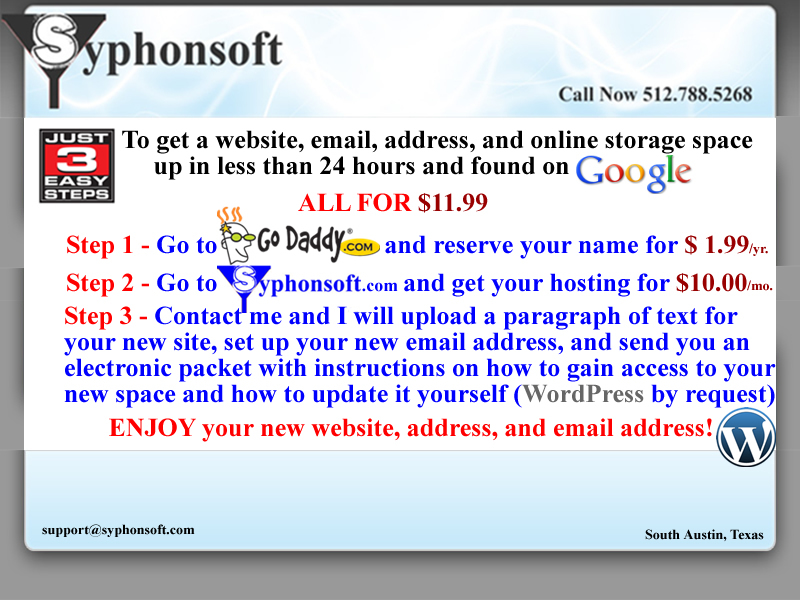 The syphonsoft website has been updated, it too using the WordPress content management system and templates. We are running the following special, this is about as low in price as anybody could possibly go. We are running this special to get new customers, anybody who has ever wanted a website, but not known where to start. I am a local Austinite, I live around Manchaca and William Cannon. Want a website, but not sure where to start? Want a custom email address? Want a cool web address to redirect to somewhere, like a facebook, myspace, twitter, linkedin, or another social networking profile? Want a web address to put on a business card? Need a professional looking email address to put on a business card? Have a small business, need to start by having a website? Need to promote yourself, need website to just show off your skills, resume, or portfolio. Have a flier that you are using for marketing and want a website with the same information on it as your marketing flier? I have figured it out and have built many websites and know exactly how to get you up and running. I would be happy to help you get started. This is to associate the new domain name with the hosting server that you will be doing in the next step. click on the link for web hosting for $10/mo. This is my site, this is what I get out of this, in case you are wondering. Contact me and let me know that steps 1 and 2 are complete and what text (up to one paragraph) to put on the the home page of your new website. In return I will provide you all of the steps to connect to your new site and software that you will need (all free). Then it is up to you to write some simple HTML, as I have written with this ad, and you are off and rolling. Normally, an additional $50 would be charged for all of this setup and additional information and guidance, but this is waived. If you get stuck or don’t feel comfortable performing the first two steps, contact me and I can guide you through. Contact me first if you would like to discuss this over email or by phone, this is legit, not a scam. I have lived in South Austin all my life and have worked with websites for over 10 years. I just thought of this way to get more people on the web for as cheap as possible. Note: The following type of built websites are not included for $11.99. If you would like this type of website design and development, contact me for a quote. We offer premium webhosting, design, and Internet consultation services. Browse our offerings below to see how we can serve your business. We offer a 30 day SATISFACTION GUARANTEE OR YOUR MONEY BACK on all services that we provide. That’s right! We round up! Sure, it could be $4.99, but really?!? Why bother, what’s a penny, you are getting gold service for that extra penny. I live in Austin the capital of Texas and the self proclaimed “Music Capital of the World” with my lovely wife Jenny and are are two beautiful children, Garrett our son, and our daughter Grace. We enjoy being together as a family and with other family in the area. We like to try new food and go to our favorite restaurants. We enjoy travel and try to go to an exciting new place every year, as well as visiting existing favorite locations. I also enjoy pursuing passions such as photography. My wife and I love music and listen to Austin musicians and touring bands as much as we can. Volunteer work for SXSW and Old Settlers Music Festival. I operate a consulting business, doing freelance business as Matthew Comer, http://matthewcomer.com. I have several projects and long-term clients. I perform consulting to the State of Texas as a Catalog Information Systems Vendor (CISV) and can be found on the Centralized Master Bidders List (CMBL) Vendor ID: 1205325509200. I am currently employed as a contractor with Titan Solutions providing consulting for IBM. I work in a great team in the Business Partner realm of the PartnerWorld portal in the IBM Global Services (IGS) division. I started my sixth consecutive year-long contract in December of 2009. I am doing some amazing work on this team. I have built a system in which editors on the team can create and maintain HTML pages using an XML integrated WebSphere system. This allows the users to create pages much more easily. I enjoy the work, this is the best work of my career. I am not looking for further employment at this point, but I am always open to hearing about other opportunities. If you are an employer or headhunter and know of a good employment opportunity that may fit my skill-set, then please view my résumé. However, know that I am not looking for other employment, nor would I likely accept other employment at this time. If you are interested in hiring me as an independent consultant, contractor, web developer/designer to develop your website; or to redevelop and rethink your website, as my specialty is redeveloping and maintaining existing sites, then please contact me. The ideal solution for clients who require the control of a dedicated server matched with the affordability and simplicity of a traditional hosting account. Our traditional web hosting is designed for clients who need bulletproof reliability and unbeatable Heroic Support at an affordable rate.